Animal behaviour experts at the University of Nottingham have developed a new tool which can be used to predict a young dog’s likelihood of successfully completing guide dog training. Working dog organisations like the charity Guide Dogs, who funded the research, need to regularly assess the behaviour of the dogs they breed for training as not all of them turn out to be suited to the role. The charity is the largest of its kind in the world, breeding around 1,400 dogs for possible guide dog training every year. As part of a wider £500k epidemiology research collaboration with Guide Dogs, the researchers in the University’s School of Veterinary Medicine and Science have created and tested a questionnaire-style decision tool which could help trainers from Guide Dogs to monitor and evaluate their dog’s behaviour. The tool successfully predicted training outcomes in 16.9% of young dogs of 5 to 12 months old to an accuracy of 84%. The tool is called the Puppy Training Supervisor Questionnaire (PTSQ). The aim is to identify dogs who are not suitable to a guiding role early, before they enter time-consuming and costly formal training. The PTSQ is also intended to improve the understanding of a young dog’s behaviour, which Guide Dogs will use to inform their future training processes to give the best chances of success. The full study has been published in the journal PLOS ONE. The research also evaluated aspects of the questionnaire’s reliability and accuracy. The results of the questionnaires completed by the training supervisors – 1,401 in total – showed consistency of individual dogs’ scores over the three age ranges. Of the dogs included in the study, 58% went on to qualify as guide dogs, 27% were behaviourally unsuited to guiding work and the remainder were unsuited for health reasons. Within this number there were also dogs with exceptional character and temperament who were selected for breeding. The researchers say the work could be extended in the future to follow up the dogs’ working life as a guide dog. They say this could help shed light on why some dogs are retired early for behavioural reasons and the human and dog factors which contribute to this unique partnership’s success. 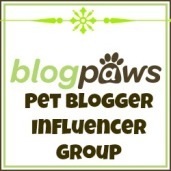 Just a few thoughts in this post about the need to investigate behavior changes in our dogs. Since our dogs can’t communicate with us in our language, behavior changes can be an indicator of an underlying physical condition. a) I have been working with a client in my nutrition practice to isolate the food ingredients that her dog will tolerate. He’s been a very itchy boy. Working in combination with a vet, we’ve isolated both the foods he can’t tolerate and also environmental factors that need to be managed. He was still gnawing at his feet, however. So this very good owner called in a dog trainer who pointed out that her dog was anxious – needing more boundaries at home. His condition continues to improve as his owner implements a training program and I am now working on recipes for the homemade portion of his diet. Lessons: A good owner keeps observing and bringing the right skills and people into their dog’s care team. Problems are often multi-layered and they need different skill sets. Rarely does one professional tick all the boxes. b) I was contacted by a dog owner who has had their dog on pain medication for a while and wanted to know what I could do for him since he didn’t respond to acupuncture. They returned from an overseas vacation and were told that there dog was happy and playful at the boarding kennels. But, to them he was withdrawn and unhappy. My recommendation was to get back to the vet for x-rays to help with a diagnosis before taking a ‘shot in the dark’ about what to try. The x-rays have proven a number of structural conditions with his spine and tail. We now have a better chance of getting together a management plan that will work. Lessons: It’s understandable that owners are reluctant to put their dog under anesthesia in order to have tests done. But if a condition isn’t improving, pain medication alone isn’t the answer without knowing the rest of the story. Your dog deserves a solid diagnosis and you need it to have the best chance of success in managing their health. c) Another itchy dog. This time, much more than usual. He’s had a history of food reaction. The owners introduced a new treat that marketed itself as having high levels of antioxidants as a way of augmenting his homemade diet. Who wouldn’t give this a try? But the change in behavior – itching not only his ears and feet but also constantly licking at his private parts – was marked. I read the label on these new treats, which use wheat. I am 99% sure that his previous intolerance to commercial foods was caused by the grain content. My recommendation – ditch the new treats and move onto other solutions. We’re doing this now. Lessons: Just because the label says the product benefits health doesn’t mean it will for every dog. Be willing to withdraw products in favor of new ones. I promise to have realistic expectations of the role my dog will play in my life. I will remember that she is a dog, not a furry little human; she cannot satisfy all my emotional needs. I promise to protect my dog from dangers, such as traffic and other creatures who might want to hurt her. I promise to keep her well dressed with a collar containing up-to-date I.D. I promise to learn kind and gentle training methods so that she can understand what I am trying to say. I promise to be consistent with my training, since dogs feel secure when daily life is predictable, with fair rules and structure. I promise to match her loyalty and patience with my own. I promise that my dog will be part of my family. I will make a commitment to schedule time every day to interact with her so that she will feel loved and will not develop behavior problems from a lack of stimulation and socialization. I promise to seek professional help if my dog develops behavior problems that become unmanageable. I promise that my dog will have opportunities to exercise and honor some of her instincts. She’ll have walks and runs outside of her daily territory, so she can sniff and explore. I promise to provide veterinary care for her entire life. I will keep her healthy and watch her weight. I promise that if I move, marry, have a baby, or get divorced, she will continue to share my life, since she is a beloved family member. I promise that if I absolutely must give her up, I will find an appropriate home for her that is as good as or better than my home. The hierarchy in a group of dogs is not based on aggression but on submissiveness, says newly published research. 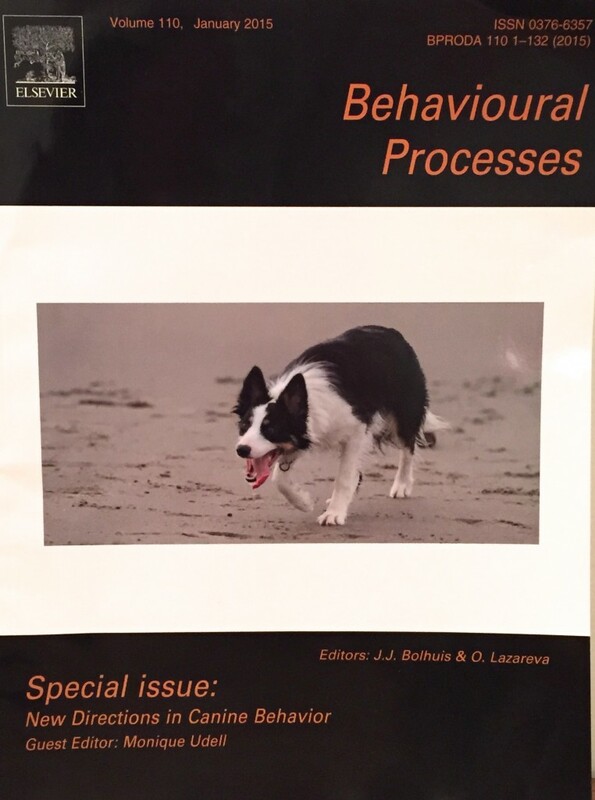 A dog ranked lower in the hierarchy displays signals of submissive behaviour towards dogs ranked higher. These findings have for the first time been substantiated by means of measurements by dog researcher Joanne van der Borg of Wageningen University and colleagues based in Utrecht. Two beagles from the group of dogs studied. Communication by means of postures plays a central role in identifying dominance relationships between two dogs. 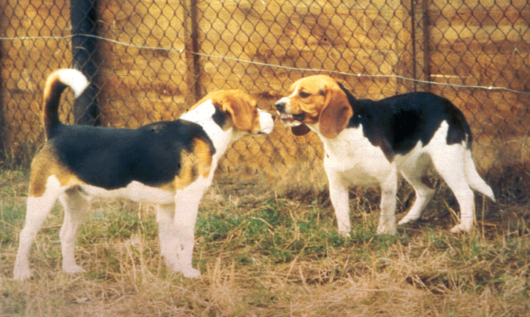 The display of a lowered posture during an interaction by Zwart (the beagle on the right) is an acknowledgement of the higher status of Witband (left), who adopts a higher posture. Both dogs display mutual aggression (Witband by staring fixedly and Zwart by baring his teeth), which was found not to be a suitable measure of dominance. Photo: Joanne van der Borg. In the study into dominance, a group of dogs was placed together on working days, and stable relationships formed between them after a few months. By closely observing and analysing the exchange of seven postures and 24 behaviours by the dogs, the researchers were able to establish a hierarchy. This proved to be linear. The suitability of signals as a measure of dominance was determined using the exchange of signals between two animals. Suitable signals are postures or behaviours which are only displayed within a relationship from animal A to animal B and not in the opposite direction. Based on the receipt of submissive signals, the dogs were ranked from high to low. The study supports the view that the dominance in a group of dogs is not determined by aggression, as many dog owners and dog trainers believe. Aggression is found to be exhibited by higher-ranked dogs towards lower-ranked dogs but also in the opposite direction, from lower-ranked dogs towards higher-ranked dogs. For this reason, signals of aggression are not suitable as a measure of dominance. The idea of dominance in dogs is popular among some dog trainers in various countries. They believe that dogs, like wolves, are natural born fighters with only one aim: to reach the top of the hierarchy. By contrast, a different school of thought among dog trainers holds that dominance is an outdated and obsolete notion which is not applicable to our domestic dogs. There has been much misunderstanding about the interpretation of this view, because until now there was a lack of substantiation by means of hard figures. The signals of submissiveness from a dog meeting another member of its species can best be read from the lowering of the posture compared to the other dog. Another expression of acknowledgement of the higher status of the other individual is body-tail-wagging. This behaviour, often seen in young dogs when greeting other dogs, involves the tail moving in quite broad strokes, often with the hindquarters (the hind part of the body) moving with it. Both forms of submissiveness are an expression of ‘formal dominance’, because the context (aggression, greeting, play) does not matter. The findings are in line with previous results into dominance among wolves in captivity and Italian feral dogs. The study contributes to our knowledge about the ways in which dogs communicate their status towards other dogs. This is important for correctly classifying the hierarchical relationship between two dogs, and probably also between human and dog. This in turn helps establish the correct diagnosis in the event of problem behaviour and will therefore improve the welfare of dogs. And then this good-news story popped up. Barney was a challenging dog with difficult behavior – but his owners hung in there with him. 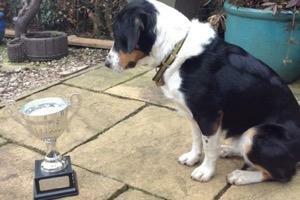 And he won Most Improved Dog at his dog training class. Dogs who suffer with separation anxiety become more optimistic when taking the animal equivalent of Prozac during behavioural treatment, according to the results of an innovative new study. Led by researchers at the University of Lincoln, UK, the research has for the first time revealed how the animals feel during the clinical treatment of behaviours associated with negative emotions. 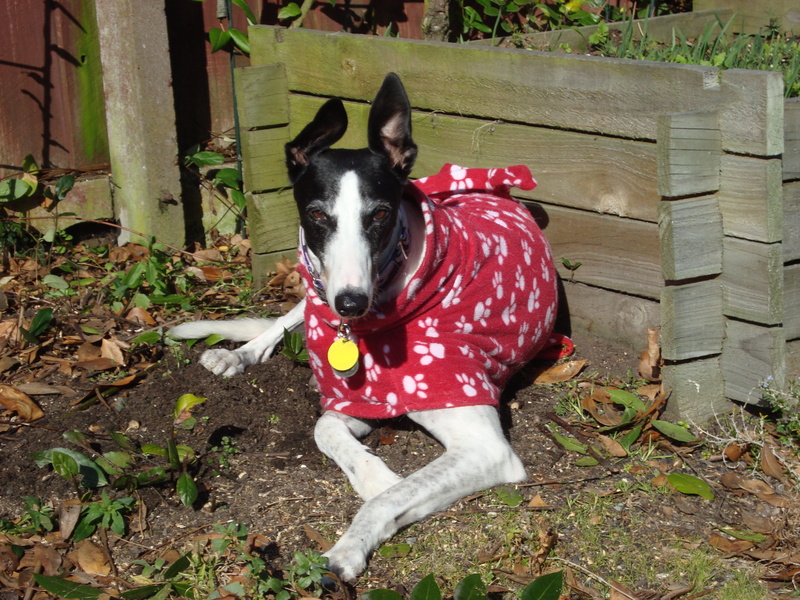 Jess Cook signed up for the study as her dog Lexi would become so distraught when left alone in the house neighbours would complain about her howling. For five weeks in 2013, Lexi, now seven, took two tablets a day in some butter. She also underwent behaviour management therapy, which taught her to cope better with being separated from her owner. Miss Cook, who runs Like My Own Pet Care Services in Derbyshire and is studying for her MSc in Clinical Animal Behaviour at the University of Lincoln, slowly built up the amount of time Lexi was left unattended for. It proved successful and now she has come off her medication. Canine separation-related problems – also described as separation anxiety or separation distress – are among the most common behavioural complaints of dog owners. But the issue of using psychoactive medication to help pets with behavioural problems is a widely debated one. Treatment with psychoactive medication in parallel with a behaviour modification plan is well documented, but it is unknown if this is associated with an improvement in underlying emotion or mood, or simply an inhibition of the behaviour. The new study, published in the peer-reviewed veterinary science journal BMC Veterinary Research, has thrown new light on the topic with researchers devising a method to evaluate animals’ emotional state when treated with fluoxetine – the active ingredient in Prozac for humans and Reconcile for pets. Prozac, the trade name for fluoxetine, is typically used to treat depression, obsessive compulsive disorder and anxiety in humans. The researchers recruited dogs showing signs of separation anxiety, such as barking, howling, destruction of property and toileting when alone, and used a special behaviour test to determine if they were feeling ‘optimistic’ or ‘pessimistic’. In the test, dogs were taught that when a food bowl was placed in one location it contained food, but when placed in another location that it was empty. The bowl was then placed in ambiguous locations, and the dogs’ response was assessed to determine whether they expected food (i.e. ‘optimistic’) or not (i.e. ‘pessimistic’). 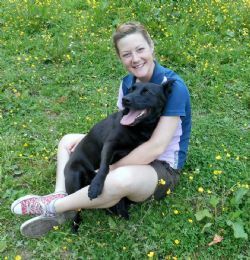 The results indicated that when dogs were treated for separation problems using both a behaviour modification programme combined with fluoxetine treatment that they did become more optimistic, and as their mood improved so did the behaviour problem. The same results were not recorded for the control group.